Kruba Wasin is an abbot of Wat SriThanNork in Yasothon Province. A disciple of LP Kliang Wat SriThat, Sisaket province. Ever been on a pilgrimage in the woods over a period of time. Master at introspection meditation (Vipassana Gammatan) and magic. KB Wasin is very famous for Khun Paen Plook Hong Prai that was taken up by worshipers very quickly. KB Wasin was born on Monday 25 April 1972 in Yasothon province. Has been interested in magical science since a boy. Age 20, asked LP Pianpon (a famous guru monk in Yasothon at that time) for studying magic with. Age 20, got ordained as a Buddhist monk in his hometown. 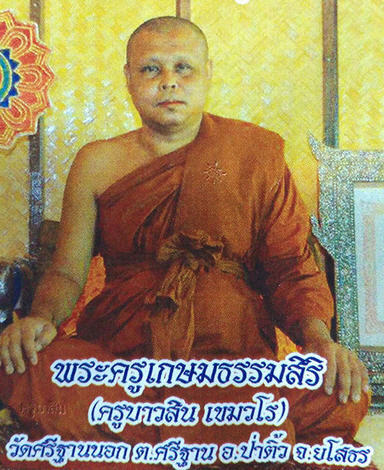 Fifth year of the monkhood, was appointed as an abbot of Wat SriThanNork, Yasothon province. Still continued studying magic and mantras. Went to Arjarn Pleng Boonyuen, a skilled guru master to learn mantras and method of making Guman Thong out of a kind of magical wood called "Mai Wua Luem Kork". Then left Arjarn Pleng to learn subject of Khun Paen, blessing Guman Thong and more with LP Phet at Wat Sing Thong in Ubon Ratchathani province. 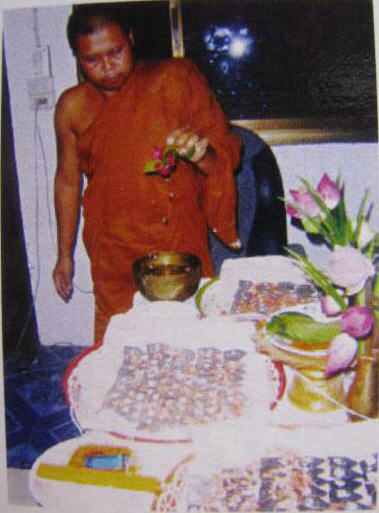 KB Wasin released his first Khun Paen named "Khun Paen Mon Mala Dorkmai" in 2002 that several guru monks joined in blessing: LP Kliang, LP Jiam, LP Hong, LP Key, LP Krueang and LP Rit. People who owned had experiences in charm and luck. And in 2008, KB Wasin built "Khun Paen Plook Hong Prai" which was mixed with ashes of 1,300 remains. That made KB Wasin famous among worshipers because some people could touch power of his amulets. Nowadays, KB Wasin has developed Wat SriThanNork so much and uses his ability to help everybody without dividing castes of people. Power: KB Wasin has competency in making Khun Paen amulet. 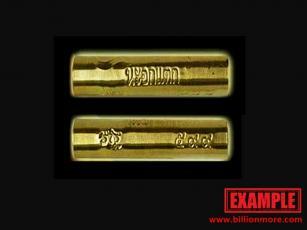 His previous Khun Paen amulet was successful and had experience in danger protection, charm, good luck and money. "Hing Hai Phee" or "Siang Jued" is a local plant in Northeastern Thailand used as main ingredient of this Khun Paen. Believed can prevent and remove black magic, drive out ghosts, protect from harm including charm, good luck and good sale. 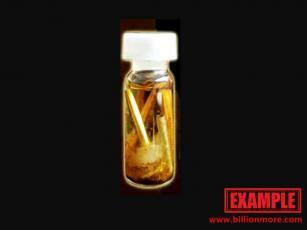 Material: This oil contains a couple of Takrut Salika, charm wood, love wood and Salika Long Rang powder. **Magic of "Salika" is believed to catch crowd's eyes, help reach the great result of speaking and love. **This Takrut was installed with Yant "Na Aok Taek" believed can make somebody cry their heart out if not seeing face of their lover. This is a powerful charm collection with multiple magical powers of 2 skilful guru monks first: Kruba Warin, Wat SriThanNork who is famous for Spiritual Khun Paen Amulets and second: LP Sawat, Wat Pa San Udom, Ubon Ratchathani province who is expert at charm magic. Ceremony: Kruba Wasin blessed this amulet by himself. Power: Magically enthralling power towards anybody helping love, business and career to easily succeed. Present: This one is Namrerk; exclusively molded by LP Sawat (teacher of Kruba Wasin) in the ceremony. The is a golden Takrut embedded, ore and jewel pieces mixed. Moreover, the amulet had been soaked in mystical Prai oil for a period of time to increase magical power. Present: This one is Namrerk; exclusively molded by LP Sawat (teacher of Kruba Wasin) in the ceremony. The is a silver Takrut embedded, ore and jewel pieces mixed. Moreover, the amulet had been soaked in mystical Prai oil for a period of time to increase magical power. "Thank you for the shorts! they are very nice and funny.Kop kun kah"